On average, an American retiree spends about $4,000 per month. But few of those retirees are getting $4,000 from their nest egg—which is partly why bankruptcy rates among retirees have been soaring for years. But there is a way to get $4,000 a month (or $48,000 a year) from your savings—even if you aren’t filthy rich. And that’s the problem with today’s low-yielding stock market. To get $48,000 per year from the S&P 500, you’d need $2.76 million to put in the market. That’s because the S&P 500’s dividend yield is a crummy 1.7%—far lower than US Treasuries and way below its long-term average! We can do better—and with little effort. 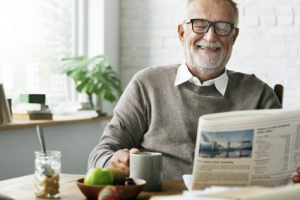 For example, the 4 funds below will give you dividends that average out around $4,000 a month and diversify you across multiple asset classes, like common stocks, bonds and preferred stocks. That gives you an extra margin of safety without limiting your income through “dead-end” investments like low-yield US Treasuries, which pay a pathetic 2.8% if you buy 10-year notes, meaning you’re guaranteed about a 0% return after inflation! And speaking of inflation, don’t forget it hits retirees harder, since costs for things like health care grow much faster than what you’ll pay for many other routine purchases. We need to get more creative. We’ll start by doing an end run around US bonds and into bonds from some of the world’s biggest cash-producing international corporations. Now that corporate profits are rising in the double digits and company bankruptcies are falling, it just makes sense. We’ll need to do more than just buy a couple corporate bonds from a broker, though. That’s because brokers often sell some of the worst-quality bonds to smaller clients, since the big institutions have already snapped up the best issues. But don’t worry; we can easily invest alongside the big institutions. To do it, we’ll use funds that diversify across hundreds of bonds while still paying big dividend yields. And we’ll use “smart beta” funds that avoid many of the pitfalls of dumb index funds, which force investors into a lot of losers alongside the winners. VCLT is attractive because it limits itself to investment-grade, high-quality companies and diversifies across 77 investments. 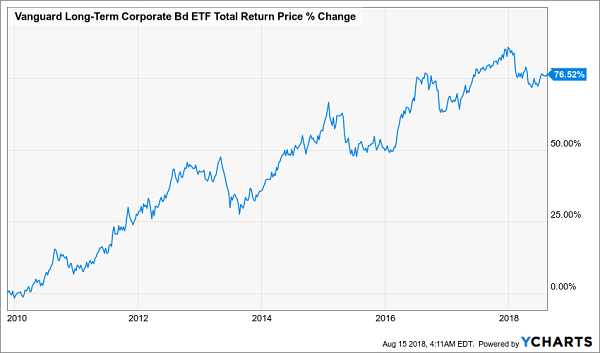 Its biggest positions are in companies known for financial prudence and steady cash flow, such as Regions Financial (RF) and Dow Chemical (DOW), with the rest of the portfolio spread across other multinationals. On top of bonds, our portfolio will need stock exposure, as well. We all know the market has been on a tear since 2009, and while we can’t expect it to go up forever, we know that stocks have a tendency to rise steadily over the long term. 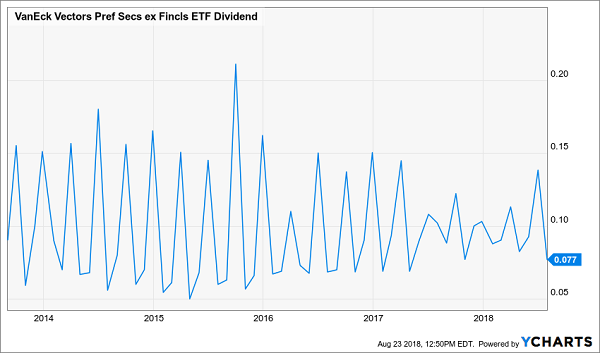 We also know that dividend stocks tend to provide more reliable long-term growth and that we can count on the best ones to keep up their dividends in most market conditions. 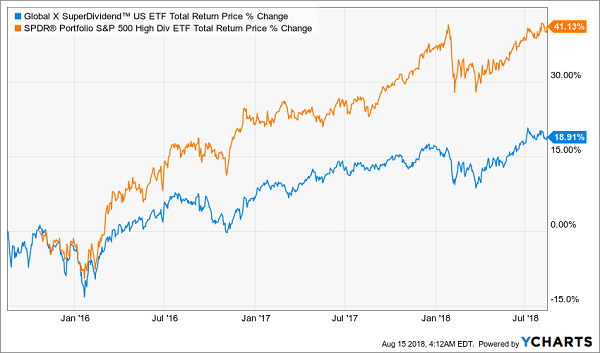 So let’s get a piece of this action with two “smart beta” ETFs focusing on strong dividend-paying companies: the Global X SuperDividend US ETF (DIV) and the SPDR S&P 500 High-Dividend ETF (SPYD). With just these two funds, we’re getting a diversified portfolio of over 70 companies across different sectors, with exposure to everything from technology to real estate to health care. You could get similar diversification with an index fund, like the SPDR S&P 500 ETF (SPY), but then you’d be stuck with dividends of 2% or less. No thanks! Instead, DIV and SPYD can give us a diversified portfolio and an average dividend yield of 5.3%. And thanks to their stalwart portfolios, these funds have provided steady gains over the past year, in addition to their big dividend payouts. Even so, neither fund has fully caught the market’s attention to this point, but that’s not too surprising; both are relatively new, and many investors just don’t know they’re out there. There’s one other secret that many investors aren’t really clued into: preferred stocks. They act like common stocks, but the market for preferreds is much smaller and tougher for everyday investors to get into. That doesn’t mean they’re illiquid, though. Big institutional investors, such as hedge funds, love these things and buy them often. Back in 2008, Warren Buffett bought a ton of preferred stock in Goldman Sachs (GS), an investment that ended up getting him a 19% annualized return by the time he sold out. So how can we follow the Oracle of Omaha’s lead? These aren’t the kinds of assets we can just buy through our online brokerage accounts; we need an insider’s help. Luckily, there are a few actively managed funds that give us just that. And they have big dividends, because preferred stocks tend to have much higher yields than common stocks. With $228,750 in each fund, we’re getting a bit more than $4,000 in monthly income, thanks to the average 5.3% yield on these 4 funds. We’re also getting bonds, stocks and exposure to high-quality companies boasting familiar names and sterling profit histories. Well that’s not exactly right. Their principal is more than 100% intact thanks to price gains like these! Which means principal is actually 110% intact after year 1, and so on.